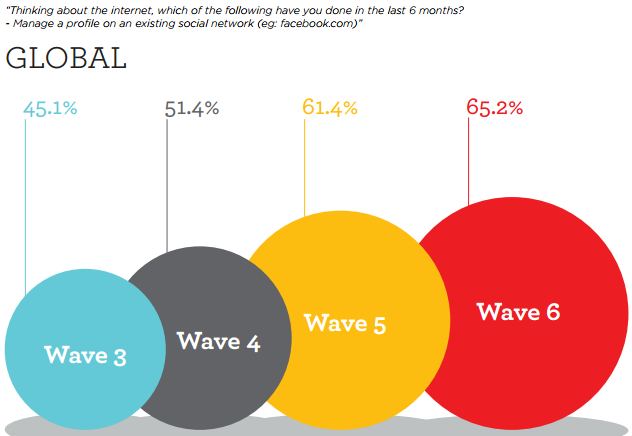 UM EMEA research team has conducted Wave 6 – a global social media study. From 2006, UM has embarked on this journey to measure the scale and impact of social media across the globe. The latest one studies the social behavior in 62 countries with 42K respondents i.e. active internet users. UM defines active users as people who log in daily or every other day. India has been part of the UM study from Wave 2, 2007 and is very well there in the Wave 6 – The Business of Social Report. I am sharing a few snapshots of the entire report which you can download from here. Growth in social networking has slowed in 2011. In 2010, when Wave 5 was published it was 61.4% and now in 2011 it is 65.2%. The growth has slowed in India too – In 2010, it was 72.5% but in 2012 it is 67.1%. However, the time spends on the social networking sites have grown. People are also spending more time than ever on social networking sites and specially the young within the age group of 16-24 years old. While 2010 may have seen the peak of many social platforms, in 2011 microblogging (Twitter, Jaiku) has been rising but universal adoption is still a worry. Adoption of microblogging has shown a downfall in India. In 2010 it was 45.5% but in 2011 it is 42.9%. 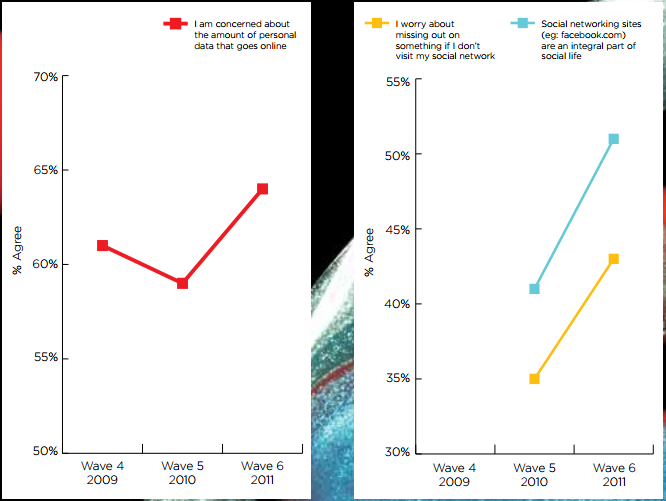 In 2011, people were more concerned about the amount of personal data that goes online. In 2010, it was below 60% but in 2011 it has climbed to 64% worldwide. However, at the same time social sites are now more integral part of life and more than 43% people think that they have missed out if they have don’t visit social networks like Facebook. Countries like UK, Canada, Japan, etc. weigh privacy more important on social networks whereas for countries like China, Brazil, India, etc., social networking is more important. Facebook is the most searched for word on the Internet but Google.com leads the race of top 10 websites globally. Along with Facebook, YouTube, Yahoo, Wikipedia, etc. have joined the party. In addition to this, company branded websites is no more liked when compared to social networks. Once again the younger generations have shown a lack of interest when visiting official company websites. Today users definitely have more ways to connect to the internet along with a computer or a laptop. However, PC, laptop and mobile devices remain the primary mode. 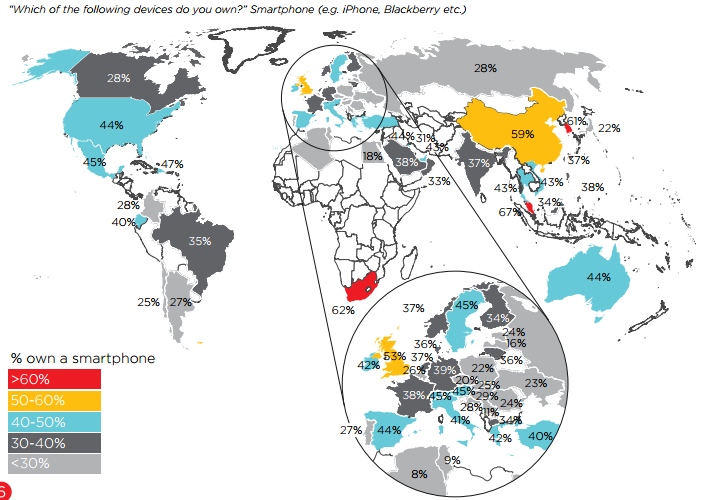 The smartphone penetration is catching up too and 30-40% of Indians own one of them. 1. Users are spending more time on social networks so it becomes essential for brands and social networks to find new ways to increase engagement with the users. The trend has changed from 2010 when the number of people signing up on networks was more, today they are spending time on it. 2. Users are savvier and are more concerned about security. It becomes more essential for networks to be open and keep the user at the topmost priority. However, Indians still haven’t taken it seriously and the ongoing debate of security issues on networks in 2012 will definitely have different results in Wave 7 report. 3. Facebook still leads the race and with 51 million Indians on the network, this should bring smile on the faces of social marketers. 4. Users are now more connected and with the penetration of smartphones and tablets, having mobile compatible products and campaigns becomes vital. 5. Also, the report clearly highlights that the younger generations (16-24) who are more hooked on to social media hardly see the customer websites. So if you are not present on social networks and creating a connection with your fans then you won’t survive for long. 6. Finally, the report also highlights the fact that customers are looking for genuine customer care from brands along with greater awareness of products on social media. So brands have no choice but to be more social.